KIEV (Sputnik) — Poroshenko said he had canceled his visit to the final of the 2017 Eurovision song contest set for May 13 because of the shelling of the town of Avdiivka in Donbas, resulting in casualties among civil population. Earlier in the day, Pavlo Zhebrivskyi, the governor of the Kiev-loyal Donetsk region administration, said that at least four civilians were killed and one injured as a result of the Donbass militia shelling the town of Avdiivka in Donbass. In turn, a representative of Donetsk People's Republic (DPR) Ministry of Defense accused Kiev forces of shelling Avdiivka in order to discredit the militia. ​"Due to the shelling of Avdiivka and deaths of civilians, I decided to cancel my stay at the final of Eurovision [song contest]," Poroshenko said on his Facebook. Ukraine won the right to host the 2017 Eurovision contest after the song "1944," performed by Ukrainian singer Jamala, ended up winning the 2016 contest. 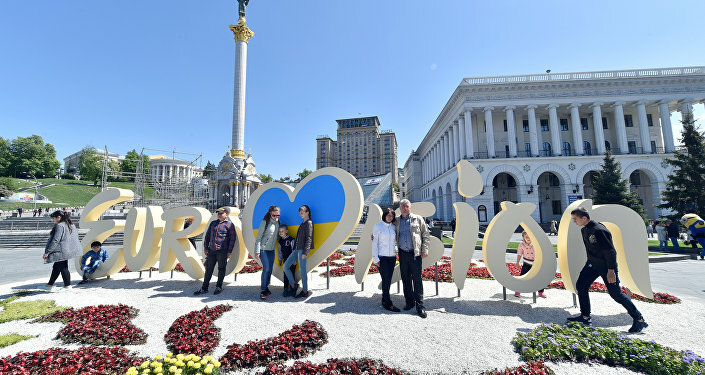 The 2017 Eurovision takes place in Kiev on May 9-13. In February 2015, the warring parties to the Ukrainian conflict in Donbass signed the Minsk peace accords in order to cease fire in the crisis-torn region. Germany, France, Russia and Ukraine, as the members of the Normandy Four, helped negotiate the Donbass ceasefire. It has been, however, repeatedly breached, with Kiev forces and Donbass militia accusing each other of violating the ceasefire regime.